AMBOY – On Sat., June 23, North Clark Historical Museum will host a dedication to the Rashford Steam Donkey at 11 a.m. The Museum is located at 21416 NE 399th St, in Amboy. The event is free for everyone; donations in support of the North Clark Historical Museum are appreciated. The Rashford Steam Donkey #582 was manufactured by Washington Ironworks Co., in Seattle. It was last operated by the Nick Rashford Logging Company in the early 1900s. 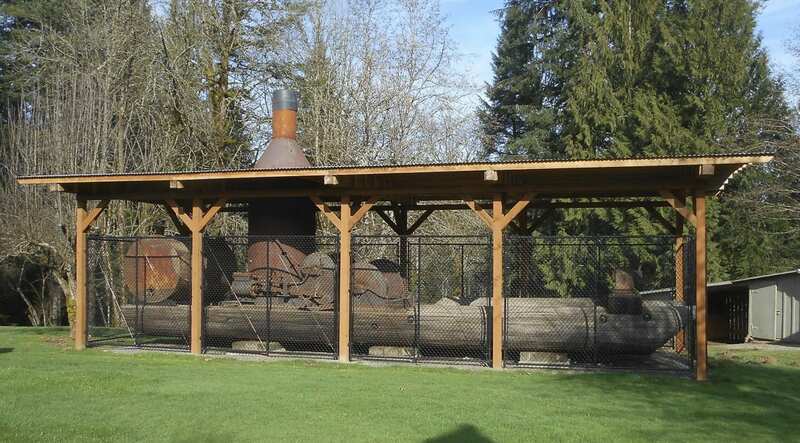 It was salvaged from a logging site near Cedar Creek and donated to the Museum by Leo Bethje. The donkey was stored at Mike Rotschy’s residence until suitable logs could be found for the sled. The Forest Service was contacted, the logs were found, and transported to the Museum. And then the work began. Many volunteers donated many hours to complete the project, and several organizations donated financing. The Board Members of the NCHM are excited to share the story of the majestic steam donkey, how it came from abandonment to a historic display of steam era logging. Bob Zumstein will be bringing his trailer with its ground lead logging model and early steam logging gear. In the basement, Joe Carson will be displaying 1/12 scale, fully articulated, models of typical machine tools c1890 and working steam engine models of similar scale. For more information, contact (360) 347-5800 and leave a message or contact Jim Malinowski at (360) 247-6404 or j.malinowski@ieee.org. The North Clark Historical Museum was founded in 1988 and is a 501(C)3 non-profit organization governed by a Board of Directors. The doors were opened in June of 2000. The Museum’s Mission Statement is to preserve North Clark County’s natural and cultural history through collections and exhibits, and to sponsor educational programs and research opportunities for the enrichment of the public.